A new twist in the Oregon standoff came as it entered its 26th day with the Tuesday night arrest of leader Ammon Bundy and several members of the armed group occupying federal land. Here are the main events that led to the current situation. What began as a normal picketing protest on January 2 turned, within hours, into a seizure of the Malheur National Wildlife Refuge, and the occupiers came to call themselves Citizens for Constitutional Freedom led by Ammon Bundy, son of Cliven Bundy, a rancher who successfully stood down federal agents on his Nevada ranch in 2014. 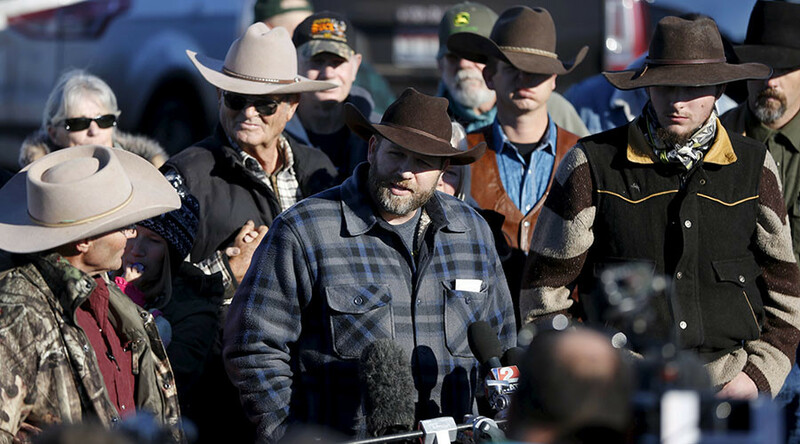 “I think that there is something much bigger here that needs to be resolved, and until we know and can understand that the people are going to end up on top here, we plan on staying,” the Citizens for Constitutional Freedom leader Ammon Bundy told reporters on the sixth day. One was the exoneration and release of imprisoned father and son ranchers Dwight Hammond, 73, and Steven, 46. The Hammonds had been re-sentenced after their time served for arson charges had been deemed below the federal mandatory minimum sentencing. The Hammonds distanced themselves from the armed group, claiming to stand up for them when they turned themselves in to federal authorities. “We're here for the people and what needs to happen here is these lands that are unconstitutionally being held, they need to be returned back to the people. And they need to have control of them, they need to be able to be free on them, they need to be able to use them without intimidation, without fear,” Bundy told reporters on January 8. The second demand was that the Malheur National Forest be handed over to the residents of Harney County. “Returning” the land to anyone is controversial, especially for the Paiute tribe of indigenous Americans. "The protesters have no right to this land. It belongs to the native people who live here," Charlotte Rodrique, chair of the Paiute tribe in Burns, told reporters during the first week of the standoff. The Burns Paiute accused the Bundy-led group of "desecrating one of our sacred sites," according to the Associated Press. Other locals protested as well, fearing the loss of public access to the land if the occupation wasn’t stopped. "I believe this is just the beginning of the land takeover. If these people get their way here, then they'll go to another place, grab that land, put it back into the private sector to go to logging, mining, and everything else, then they'll shut us off from hiking and fishing and camping and hunting, so I think this is just the beginning and it needs to be stopped here,” one resident said during a demonstration on January 20. None of the Citizens for Constitutional Freedom’s demands were met, but one silver lining the members might consider is their individual or even collective experiences. While it is unknown how many people were occupying the federal grounds, their passion was undeniable. In one instance, RT cameras captured James Stanton, a disabled and retired Navy diver from Ft. Sumner, New Mexico, who arrived with a heartfelt gift for Ammon Bundy. Stanton’s old Navy uniform jacket would symbolize his past military service, which he dedicated to Bundy. “I don’t think people would be here if they did not see that there is truly a problem, and that if they did not have hope that we could resolve it, and that's what we're doing here,” Bundy said. Certainly the occupation polarized much of the country, but on one polar end were the supporters. With 11 months left in the year and warmer days ahead, it remains to be seen if anyone was inspired enough by the January events to carry out their own demonstration.